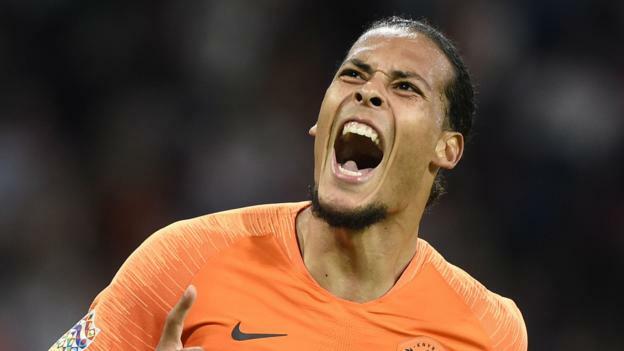 Liverpool pair Virgil van Dijk and Georginio Wijnaldum scored as the Netherlands won to send Germany to the bottom of Nations League Group A1. Van Dijk reacted first to head in from close range after Ryan Babel had headed against the crossbar following Memphis Depay’s right-wing corner. Depay added a second late on from a quick counter-attack after being set up by Quincy Promes. Wijnaldum sealed the win in injury time with a low shot into the bottom corner. Joachim Low’s Germany, who won the World Cup in 2014, have now only won three of their past 12 matches. They suffered a shock exit in the group phase of the 2018 tournament in Russia and this loss leaves them with only one point from their opening two Nations League matches. Since the end of their World Cup qualifying campaign in October 2017, Germany have only won one competitive match – a 2-1 World Cup win over Sweden – and gained two victories in friendlies – against Saudi Arabia and Peru. They face a tough task in their next match on Tuesday, 16 October as they visit world champions and Nations League Group A1 leaders France. After van Dijk’s opener, the Dutch had chances to double their lead but Georginio Wijnaldum shot wide and Depay headed off target. Manchester City forward Leroy Sane, on as a second half substitute, should have equalised but he dragged a shot just wide when unmarked eight yards out. That miss proved costly, as with Germany pushing for an equaliser, they gave the ball away and Promes set up Depay to score in the 86th minute. Depay then hit the crossbar, before Wijnaldum added another in the third minute of stoppage time. The Netherlands, managed by former Everton boss Ronald Koeman, are second in the three-nation group after beginning their campaign with a 2-1 defeat by France in September.